Shave ice in Hawaii from Shimazu Store. Shave ice in Hawaii is an iconic treat made from fluffy ice closely shaved off a block of ice. Those who are unfamiliar with this sweet snack might erroneously refer to it as “shaved ice.” But people in Hawaii simply call it shave ice. Additionally, some people mistakenly confuse shave ice with snow cones. However, snow cones come from ice that is crushed, rather than from ice shaved off a block. Shaving, rather than crushing, allows the ice to layer lightly in subtle shavings, the way snow naturally falls. When someone makes it authentically, shave ice rarely needs a straw. This is because the ice absorbs the flavoring and doesn’t seep to the bottom of the cup. The essential flavor of shave ice comes from someone pouring syrup over the ice shavings. Shave ice stands in Hawaii offer an incredibly wide range of syrup flavors. The classic strawberry and rainbow, a combination of syrup colors resembling a rainbow, are popular ones. But there are quintessentially Hawaiian flavors too. Examples include: coconut, guava, lilikoi, lychee, mango and pineapple to name a few. Many places also combine the flavors into a variety of delectable syrups. Many also offer the classic shave ice extras such as sweet azuki beans or ice cream. Places that sell shave ice typically place these additional ingredients under the ice. But there are more recent concoctions. Some places now offer topping of sweetened condensed milk. They called it the snow cap. There are also many more new toppings and add-ons too numerous to mention. This snack traces its roots to Japan, dating back to the Heian Period during 790 to 1180 AD. People in Japan called this treat kakigori. 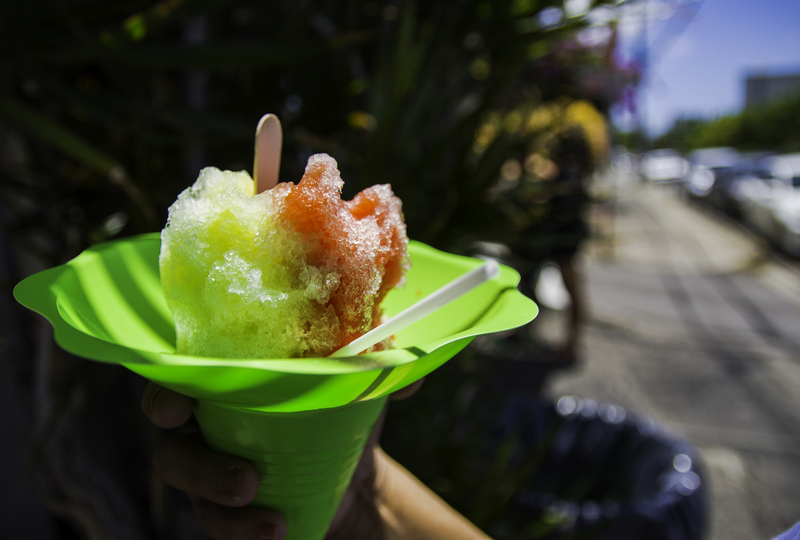 Some believe Hawaii’s version of kakigori originated in the town of Yokohama during the 1860s. Japanese immigrants first bought this icy treat to Hawaii. They were one of many ethnic groups that worked as laborers on the pineapple and sugar cane plantations. During their breaks, Japanese plantation workers would carefully shave ice off a large block with their machetes. They would then augment this with sugar cane syrup or fruit juice for a refreshing treat. As Japanese laborers gradually moved away from plantation work, some began to open stores and snack shops. Here, they also served and sold shave ice in a variety of flavors. Once available only on Sundays, this sugary snack soon became immensely popular among residents and tourists alike. In the humid climate of Hawaii, shave ice offers refreshing rejuvenation after a day in the sun and surf. You can enjoy this delicacy at all hours of the day. Enjoying shave ice in the afternoon can be an invigorating snack or be the perfect snack to end the day. Once guests enjoy genuine shave ice, they understand what all the fuss is about. There is nothing as soothing as savoring this scrumptious cool treat after long hours in the sunshine. Matsumoto Shave Ice on the North Shore of Oahu draws devoted fans. Here, they willingly wait in long lines to buy shave ice with extras such as azuki beans and ice cream. It may be one of the most popular places to get shave ice in Hawaii. Although there are countless shave ice places in Honolulu. But some of the more well-known places include: Waiola Store (a long-time local favorite), Shimazu Store (a popular shave ice stand), Uncle Clay’s House of Pure Aloha and Aliana Shave Ice. Ululani’s Shave Ice in Lahaina laces their shave ice with finely crafted flavorings and uses unique toppings. In addition to the classic flavors and combinations, Breakwall Shave Ice Company, also in Lahaina, offers ice cream on the side. Visit Local Boys Shave Ice in Lahaina and Kihei for unique options such as Shark’s Blood, Wedding Cake and Kona Coffee. They also cater for anyone hoping to throw a family reunion or island-themed birthday bash. Ono Ono Shave Ice in Kapa’a is well-named, as this ono (meaning delicious in Hawaiian) shave ice is a must-try. Uncle’s Shave Ice & Smoothies in Koloa, Jo-Jo’s Shave Ice in Waimea and Shave Ice Paradise in Princeville are also great places. Anuenue Ice Cream and Shave Ice in Waimea creates colorful blends and rainbow shave ice treats. The Original Big Island Shave Ice Company, also in Waimea, serves up shave ice in food truck style, with yummy flavors like macadamia nut cream and sweet potato. Da Shave Ice Place in Kailua-Kona is another quaint and simple stop, featuring beloved flavors like haupia and strawberry cream. Big Daddy’s in Kaunakakai, Molokai makes beautiful version of rainbow shave ice. While those in Kualapu’u can stop at Coffees of Hawaii for some delicious shave ice.